Fruit from Rita's Crown and Chapel Vineyard. Vibrant aromas of spiced pear, lemon curd and honeysuckle. This expressive Chardonnay offers vibrant aromas of spiced pear, lemon curd and honeysuckle accented by hints of lime zest and sea spray. 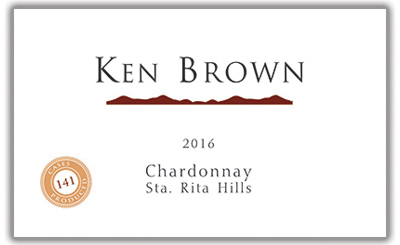 An explosion of fruit meets the palate, with bright flavors of Envy apple and white nectarine with a touch of Meyer lemon, fresh thyme and mineral notes characteristic of Rita’s Crown Chardonnay. The wine’s perfect balance of richness and natural acidity is particularly remarkable, ensuring excellent development and even more complexity with additional bottle age. 74% Rita’s Crown Vineyard, 26% Chapel Vineyard. Rita’s Crown Vineyard is situated at an elevation of 600 to 950 feet on a dramatic southwest-facing slope at the “crown” of the Santa Rita Hills where it is especially exposed to marine fog and winds from the nearby Pacific Ocean. The vines are planted to the classic white Burgundy clone 124. Chapel Vineyard (formerly known as Huber Vineyard) is located along the northern corridor of the Santa Rita Hills and is planted to the famed Wente clone of Chardonnay. Unseasonably warm weather in February was moderated by cold nighttime temperatures, suppressing budbreak until early March, a bit later than the 2014 and 2015 vintages. While the limited winter rainfall was disappointing, the timing was advantageous. Most precipitation fell January through March, allowing flowering and set to occur without the threat of damage. The rest of the harvest season saw cooler temperatures alternate with short warmer spells, which helped winemakers target optimum ripening of the fruit. Crop yields were average and berry size was small to medium. The grapes were handpicked and gently pressed as whole clusters. After settling in tank for 24 hours, the juice was racked to 60-gallon French oak barrels for fermentation. The wine was 100% barrel fermented with 100% malo-lactic fermentation. It aged sur lie for 11 months in French oak, including 14% new French oak. The wine was bottled on August 28, 2017.